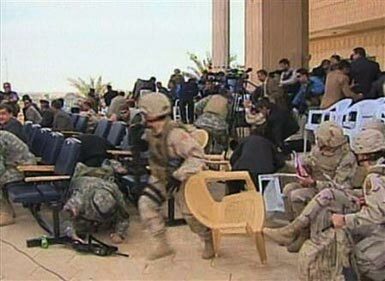 On November 22, the base was supposed to be a handed over from U.S. troops to the Iraqis. A mortar strike interrupted the ceremony. The good news is that 2006 will see the effective end of the western occupation of Iraq. It will end because everyone will be exhausted: the Americans, the British, the Iraqis and their neighbours. It will end because all justification for its continuance will have evaporated. Reliable reporting from Iraq is now so dangerous that the level of insecurity can be gleaned only from circumstantial evidence. Baghdad outside the American green zone is now all “red zone”, off limits to any but the most reckless foreigner. ...The concept of an “occupying power” is near meaningless. In reality the occupation cut and ran from Iraq in the course of 2004. This was when the Americans and their allies abandoned the policing of towns and cities and retreated bruised to more than 100 fortified bases. This is not like the Vietnam war, when American soldiers could move round Saigon at will. The bases are like crusader castles dotting a hostile Levant. Movement between them must be by air or heavily armoured convoy. The responsibility of the U.S. peace movement to try to hasten the end and make what amends we can for the disaster we caused is not over.